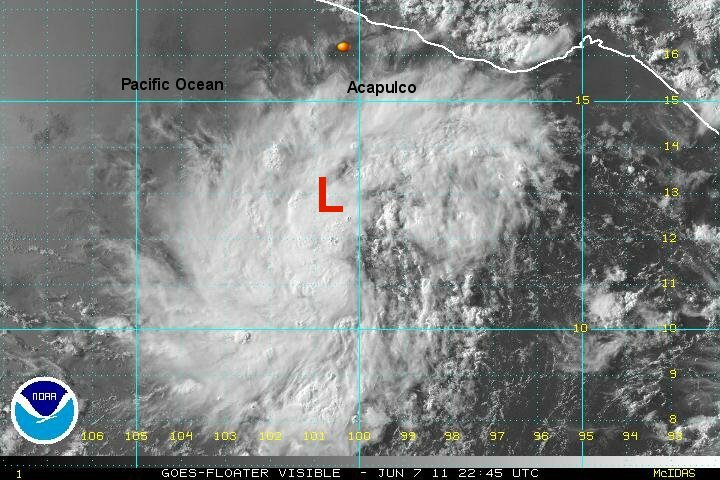 Unofficial tropical depression 1 E is centered near 11.8 N / 100.0 w or about 350 miles south of Acapulco. Movement is west northwest at about 10 mph. Top sustained winds are estimated at 30 mph. Deep convection and banding are now shaping up quickly and we expect this tropical disturbance to be officially named on the 8 am pdt advisory. As expected the hurricane center raised the tropical disturbance to depression 1e at 9 am edt. Banding is increasing andwe now believe that tropical storm Adrian has formed. 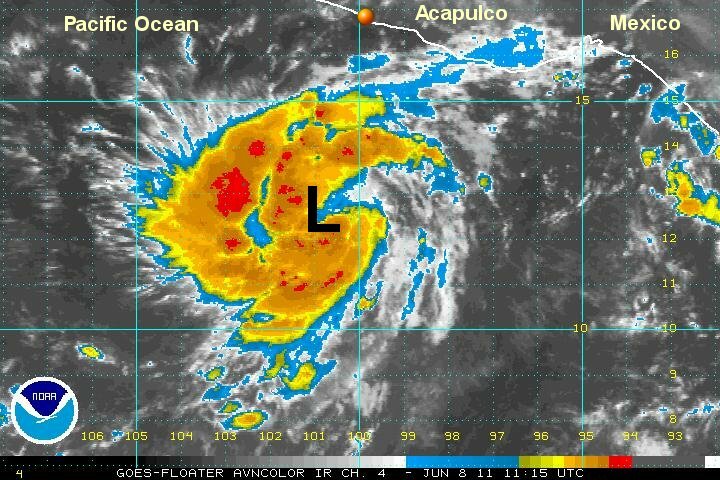 As of Unofficial tropical storm Adrian is centered near 11.9 N / 100.5 w or about 340 miles south of Acapulco. Movement is west northwest at about 5 mph. Top sustained winds are estimated at 40 mph (35 mph, NHC 2pm pdt). Forecasts call for Adrian to strengthen and become a hurricane but remain offshore. It would still be wise for interests on the western Mexican coast to follow the progress of this tropical cyclone. Once again as expected the hurricane center named tropical storm Adrian shortly after our last advisory. 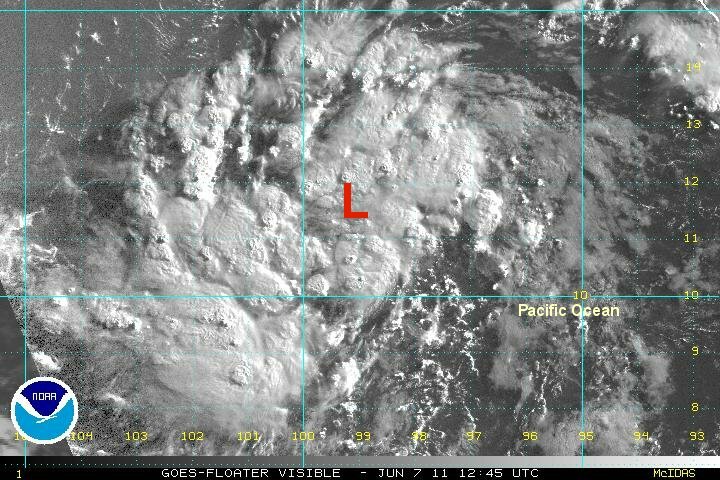 Adrian strengthened overnight and outflow aloft is favorable for additional development. 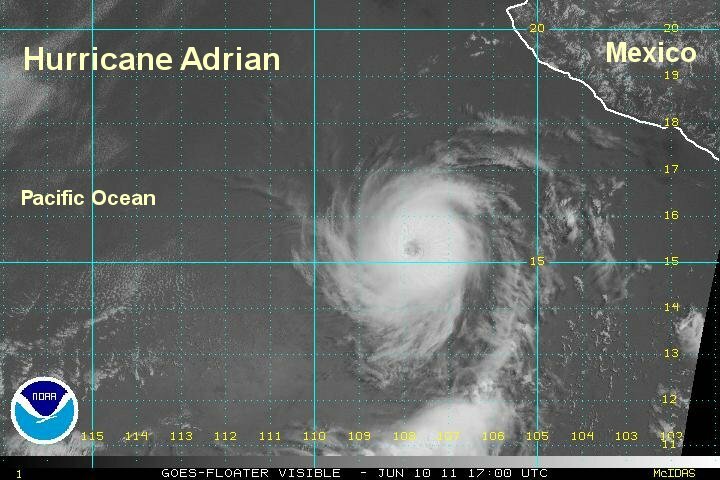 It is likely that Adrian will become a hurricane during the next 24 hours. As of 8 am edt / 5 am pdt tropical storm Adrian was centered near 12.3 N / 100.9 w or about 315 miles south southwest of Acapulco / 365 south of Zihuatanejo. Movement is west northwest at about 5 mph. Top sustained winds are estimated at 60 mph (60 mph, NHC 5 am pdt). Pressure estimated at 996 mb. 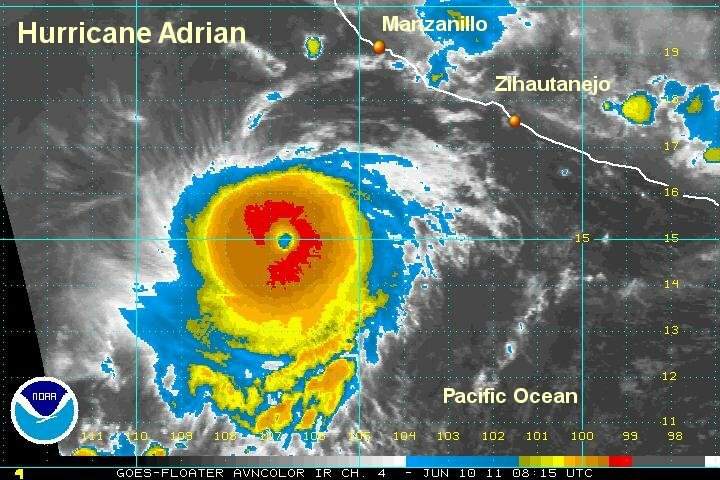 Adrian is entering a rapid deepening cycle and nearly a major hurricane. The national hurricane center estimate was just before this cycle began. The next update at 8 am pdt will likely indicate that Adrian is near our estimate of 110 mph or 115 mph - a cat 3 hurricane. 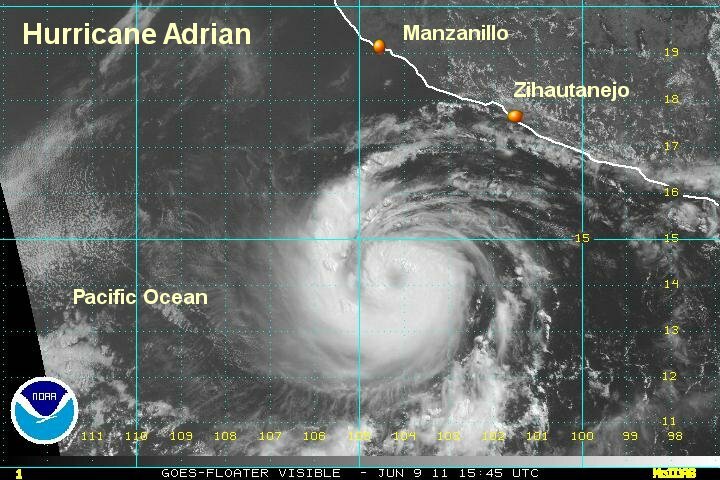 Adrian continues to be well offshore and is not a direct threat to Mexico. Because of this, updates will not be posted as often. As of 9 am edt / 6 am pdt hurricane Adrian was centered near 14.3 N / 103.7 w or about 270 miles south southwest of Zihuatanejo, Mexico. Movement is west northwest at about 12 mph. Top sustained winds are estimated at 110 mph (90 mph, NHC 5 am pdt). Pressure estimated at 965 mb. Forecasts keep Adrian well offshore and it should not be a direct threat to Mexico. Higher than normal swell can be expected on the western coast of Mexico and Cabo San Lucas the next several days. Adrian was upgraded to a cat 3 hurricane as expected. It is now a cat 4 and we are in good agreement with the national hurricane center on its position and strength. Outflow remains excellent for strengthening or holding steady. Today will be the max winds since Adrian will be moving over colder water, taking away its source of energy. 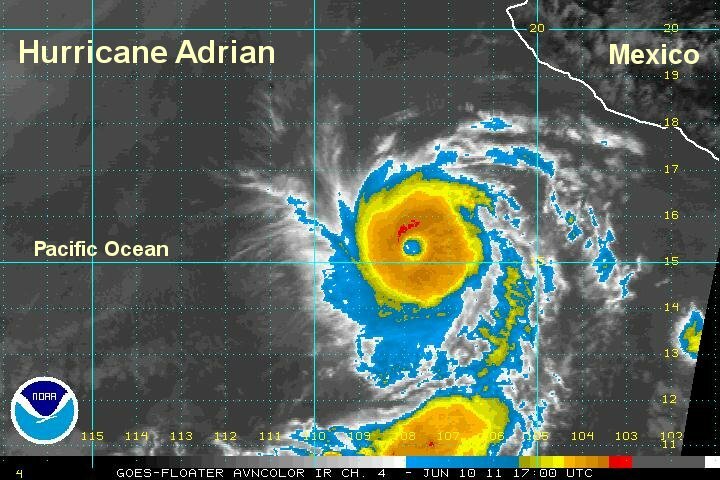 As of 5 am edt / 2 am pdt hurricane Adrian was centered near 15.0 N / 106.5 W or about 3100 miles south southwest of Manzanillo, Mexico. Movement is west northwest at about 9 mph. Top sustained winds are estimated at 145 mph (140 mph, NHC 5 am edt). Pressure estimated at 946 mb. 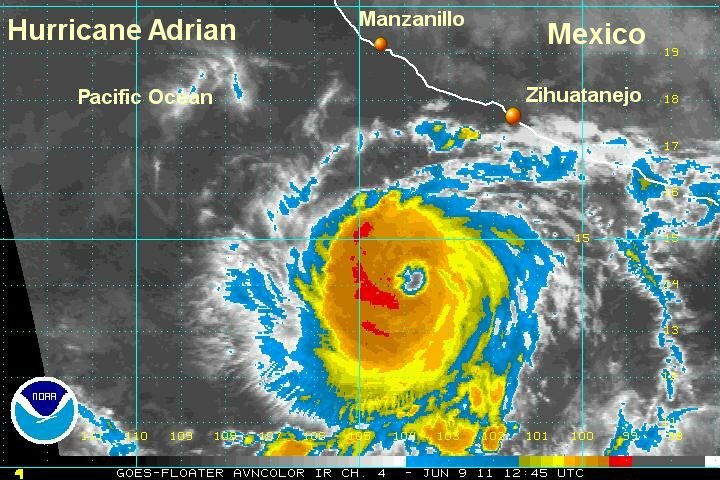 Hurricane Adrian will not be a direct threat to Mexico. Higher than normal swell can be expected on the western coast of Mexico and Cabo San Lucas the next few days. Compare Thursday's visible satellite imagery with Friday mornings satellite imagery. Notice the near perfect circular pattern by Friday morning. 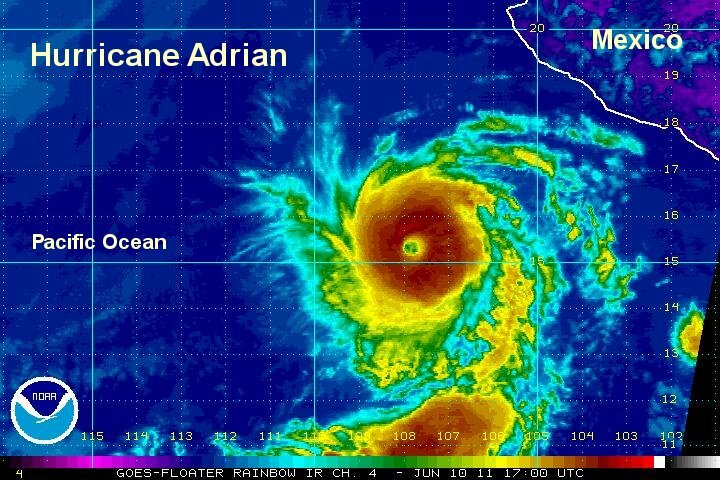 Adrian is following the lifecycle of a "normal" eastern Pacific hurricane. It formed in the monsoon trough south of Mexico and moved on a west northwest course out to sea over colder water. This colder water robbed the energy to strengthen Adrian. This will be our last update. Look at the following satellite images from Friday of hurricane Adrian as is was at its top official strength of 140 mph.